The smartphone data usage trend and the decline in cellular voice minute usage is concerning to the telecom industry. In theory, you really don't really need to buy talk time minutes if you have a data plan or only use WiFi for making VoIP calls. Carriers are constantly pushing their fast new 4G LTE networks but in reality they compete with Free WiFi. So as a consumer you should be smart about what you buy. Here are list of data plans in order of pricing. The trick is buying a phone on the provider network or have an unlocked phone that works on any of these networks. Virgin Mobile - No Contract plan for $25 per month which includes unlimited data, text, and 300 calling minutes on 3G. Tracfone / Net10 - No Contract $45 per month with unlimited data, text, and talk on 3G. MetroPCS - No Contract for $40 per month with unlimited talk, text. Some data roaming charges may apply as the network is limited in size but they do have an LTE network that is fast. Boost Mobile - No Contract: for $40 per month with unlimited talk, text, data, no roaming charges. 3G available with some phones. T-Mobile (Best Value! )- No Contract for $40 per month which includes unlimited data on 3G and 4G HSPA+ Blackberry phones will cost you $50 per month for unlimited data. If you are an older customer hopefully you have been grandfathered into their old plan which costs $25 per month. Sprint - Requires a 2-year contract for $69.99 per month which includes unlimited data, text, and calling. AT&T data plan - plans range in price from $15 for a 200 MB data plan and $25 per month for 2 MB. If are conscious about downloading video on WiFi their pricing plans might work for you. Caution because just like texting they have crazy data charges of $10 per 1 GB of data if you go over and the data is not reusable on monthly basis. AT&T is also rolling out a 4G HSPA+ network. Verizon Wireless - Requires customers to buy a mobile package that is more than $30 per month and you’re limited to 5GB per month. They do have an LTE network coming out in 2011 but this will require you to purchase an LTE compatible phone. 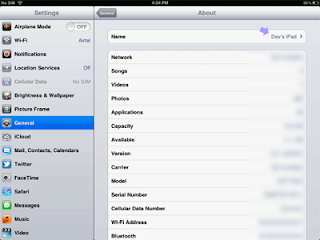 If your home has multiple iPads in your home or office running on the same network you should be aware of this problem. My home has 3 iPads: iPad 1, iPad 2 and an iPad Mini and our reception was getting worse and worse. I noticed over time that each iPad was dropping the WiFi network more and more. Each iPad would drop reception while searching from the Safari and Chrome browser and also while downloading from the App Store. This first thing I did was to change the WiFi DNS settings to Google at 8.8.8.8. This improved speeds a little bit but the connections kept dropping. I took me a while to figure it out but I realized each iPad had the same name. 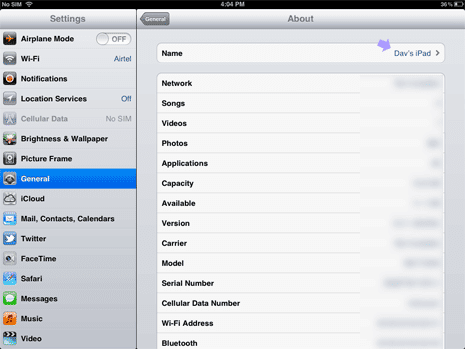 By simply changing the name of each iPad the reception problems improved drastically. Verizon Fios apparently views devices with the same name on the network as the same device and thus each of the iPads were competing for the same IP address from the router.